Currently 1579 Government madhymik vidyalaya now conducted by state government of UP. 558 out or 1579 college are very old college and 1021 Rajkiya madhymik vidyalaya was opened under RMSA scheme. But due not completing the recruitment process of teacher these colleges are facing huge crises of teachers. 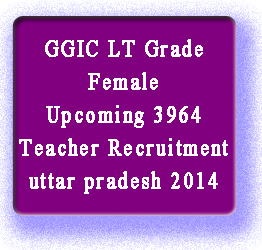 Last vacancy was came in 2011 for 4500 female teacher for GGIC school. Currently 3964 Teacher posts are vacant in these school. Official are also working rapidly on this vacancy due code of conduct issue of Upcoming parliament election. So its expected that amendment will be done in the month of February after that official notification / application form will be available online at the end of February 2014. What is the eligibility criteria for applying in ggic ? ggic me vacancy nikalee thi kya ..koi reqruitment hui hai kya abhi ..
Sc me science biology se 72.87percent he Kya chances he?? ?